E-Z Ride Stirrups are the #1 long distance stirrup! 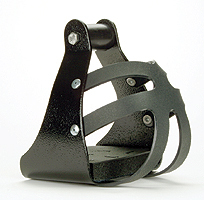 These powder painted, aluminum stirrups rate the highest in comfort and quality. The wide, deep, cushioned foot bed allows excellent weight and pressure distribution throughout the foot. Your ankles, knees and back will feel more comfortable. The topbar deadens the shock forces transmitted caused by the motion of riding, helping you stay comfortable during long hours in the saddle. The cage is made of smooth durable nylon. Top bar sizes: 1", 2" or 3"